Over the past two years, New York City residents have been awaiting the unveiling of one of the city’s most complex and outlandish landmark attractions. The Vessel—a 150-foot-tall, beehive-esque, interactive art installation in Manhattan’s Hudson Yards—is now allowing people to sign up for early tickets for a first step on its massive stairs. Visitors must sign up for specific time slots for entry into the free, climbable public space, which is expected to be engulfed by a frenzy of locals and tourists when it opens this coming spring. Composed of concrete and shimmering bronzed steel, the $150 million landmark, which will serve as the centerpiece of the Hudson Yards Plaza, topped out last December. The honeycomb-shaped megastructure will undoubtedly shape the nascent aesthetic of the new West Side neighborhood, one that is unique for its location above a massive rail yard. 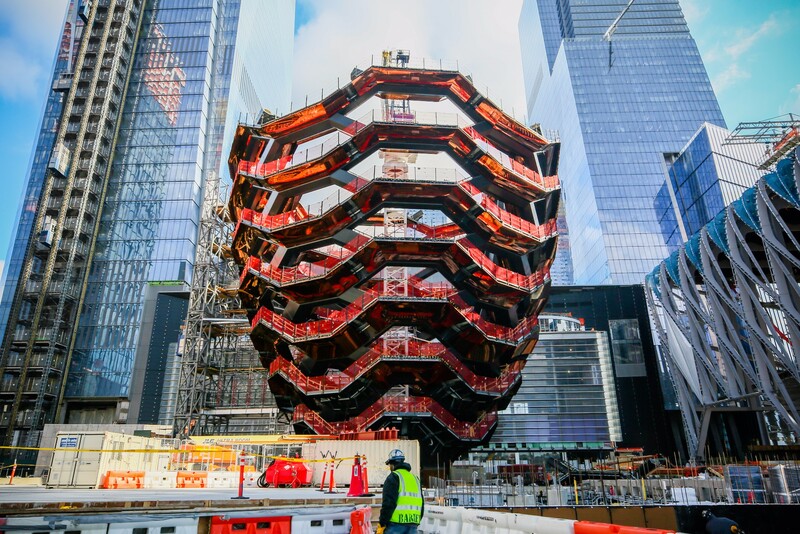 Aside from the Vessel itself, whose 2,500 steps, 14 flights, 80 landings, and 16 stories can hold over 1,000 people at a time, the site at Hudson Yards Plaza will also comprise a fountain and over 27 acres of landscaped space for events with views across the Hudson River and Manhattan. London-based Heatherwick Studio was chosen to design the landmark. To create a memorable work of art, the studio chose to build a structure that visitors could not only look at, but also use and explore.